Oktoberfest this year is from 5th-22nd October. Having an Oktoberfest Themed Party is such great fun and there are so many ways to bring the theme to life including Oktoberfest Decorations, Oktoberfest Fancy Dress Costumes and Oktoberfest Accessories. We have lots of Oktoberfest Ideas to help you put together a fantastic Oktoberfest Party. we would love to hear from you if you are hosting or going to any Oktoberfest Events. Oktoberfest is a festival held annually in Munich and is a big part of Bavarian culture. This is the largest Beer Festival and Fair which this year runs from 5th – 22nd October and people attend from all over the world. Oktoberfest began with the Royal Wedding of King Ludwig I to Princess Therese of Saxony-Hildburghausen. These days traditional folk music is played which becomes louder as the evening wears on and more beer is drunk, then the dancing and singing begins. If you are not able to get to Munich for this event there are loads of ways to bring Oktoberfest to you. We have lots Oktoberfest Party Ideas to create a fantastic Oktoberfest Themed Party and our Oktoberfest Decorations and German Decorations are ideal for any party, large or small, private or corporate. To push the boat out for Oktoberfest and to impress your guests Oktoberfest Decorations are the place to start. Oktoberfest Banners such as Beer Garden and Welcome to Oktoberfest are bright and let your guests know where the party is as does an Oktoberfest Garden Sign. An Oktoberfest theme is added to with Oktoberfest Party Decorations such as Paper Ball Decorations, Paper Fans and Hanging Whirls which look so effective. Oktoberfest Decoration Cutouts which are always popular and include a Beer Stein, Pretzel, Oktoberfest Sign and a traditional Jointed Fraulein and Mr. Oktoberfest. 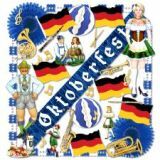 Oktoberfest Bunting is very distinctive and great for Pubs, Bars and Restaurants celebrating Oktoberfest, choose from Pennant or Triangle Bunting which is of course also perfect for small venues and parties at home. A Bavarian Decoration Set makes choosing easy and includes all you need. Oktoberfest Fancy Dress Costumes are brilliant fun to wear for an Oktoberfest Party and a Bavarian Man Costume and Bavarian Beer Girl are classic Oktoberfest options. If it is Oktoberfest Accessories that you prefer to wear then an Oktoberfest Sash and Beer Glasses are an easy alternative as are Bavarian Hats, choose from a Bavarian Checked Hat, a Bavarian Brown Hat with a Feather or Green Fedora Hat. For a Novelty Oktoberfest Hat our Beer Keg and Oktoberfest Top Hat are really cool. We have lots of delivery options to make sure you get all of you Oktoberfest Party Products in time for Oktoberfest. How are you going to celebrate Oktoberfest this year?